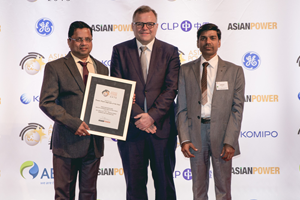 IB Thermal, 23/09/2016: Odisha Power Generation Corporation Ltd. (OPGC) added another feather to its cap by clinching the much coveted “Gold Award” in the Category “Power Plant Upgrade of the Year” in Asian Power Awards night 2016 held on 21st September evening in Seoul, South Korea. “Asian Power Awards” is the most prestigious awards in Asia and is dubbed as the OSCARS of the power industry. OPGC earned this award for its innovative plant upgrade named “Pressure Reducing and De-Superheating System” (PRDS). Silver Award went to Hsinta Power Station Unit 1 of Taiwan Power Company while Bronze Award was presented to China Zhejiang Guohua ZheNeng Power Company(4x600MW Units) of Emerson. Mr. Sukanta Kumar Mohapatra, General Manager (O & M) along with Mr. Shrikar Tripathy, Dy. General Manager (Mechanical) represented OPGC at the Awards Ceremony. The OPGC team which developed the PRDS project include Mr. A.S. Rao (Chief Manager-Elect. ), Mr. Shrikar Tripathy (DGM-Mech.Maint. ), Mr.Amit Kumar Sahu (Asst.Manager-Operation), Mr. Manoj Dongre (Asst.Manager- C & I) and Akshaya Ku. Hati (Sr. Tech.-Elect.). IB Thermal Power Station of OPGC faced issues on unstable stem pressure control and significance stem leakage. This problem was sorted out by the above mentioned in-house team through adopting AES Performance Excellence (APEX) programme resulting in a saving of about Rs.54 Lakh per annum to OPGC.